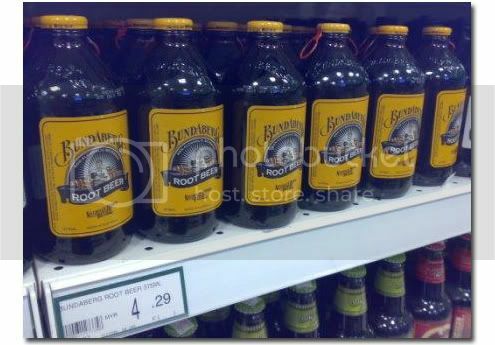 Since our visit to Marché in Singapore, hubbs and I have been craving the Bundaberg Root Beer sold there. I have also been craving for the calamari, grilled chicken breast and the swiss cross buns, more so because during our second visit there, I was not feeling well and thus, did not manage to eat much. So when we were planning our one-day trip to Damansara at The Curve last weekend, I straightaway decided that a meal at Marché would HAVE to be factored in. Somehow. Now how did Marché The Curve compare to Marché VivoCity? Marché The Curve used a paper card system instead of the ATM card-like system employed in Singapore. The paper card was way bigger and harder to handle compared to the convenience of the ATM card-like system. No calamari, and even though the grilled chicken breast was on the menu, I was told that they were out of it that night. The swiss cross buns was not soft, and felt unfresh. it was sticky on the outside and dry on the inside. Of course it could be masked if I dipped it into the soup, but that’s another story altogether. 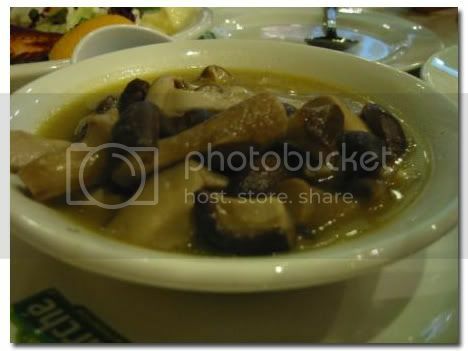 The mushroom soup was okay, but not as thick as I would have liked it to be. I did like the dried bread cubes which I sprinkled liberally in my soup though. That certainly added some texture to the soup. The grilled sausages were all right, but felt like they were fresh from a freezer. The ones in Singapore tasted meatier and more authentic in comparison. I did like the veal sausage though, and that one went down really well with Ethan too. The sautéed mushrooms. Well done, tasted not too mushy and went down really well. It cost only RM8++, and was worth every sen of it. My BIL commented that some evaporated milk could have been added into it. The crépè with ice cream. I ordered the mango and banana crépè, which was served with chocolate ice cream, and drizzled with chocolate and raspberry sauce. Sinful, yes… and delicious too. Unfortunately the ice cream that it came with was not the Movenpïck kind. 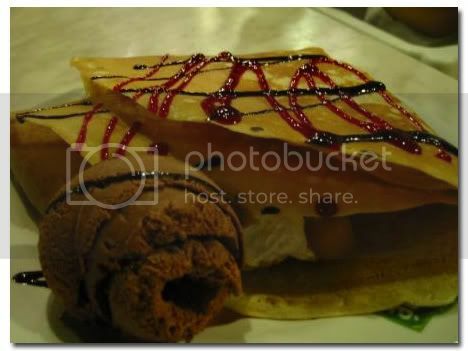 I was told that I had to pay an additional RM8 or so, if I chose to have a scoop of Movenpïck ice cream added. And what about our root beer craving? Well, we saw bottles of it on sale in Cold Storage, so we grabbed a few then and there. 🙂 Don’t need no Marché to serve us ’em root beer, huh? This entry was posted in Drooling & Cooking. Bookmark the permalink. good morning giddy tiger! me no angry. me safe as a moo, at this moment ie. hehe. so you got your Bundaberg Root Beer finally. can understand how far a craving can go! hahha. Never tried Marche here but I didn’t think too much of it even when I tried it in Spore. Bundaberg’s named after a little town called Bundaberg in the Land Down Under! The Giddy Tiger says: Oh, that’s nice to know…I bet the folks in Bundaberg drink root beer every day huh? Has Marche Sg changed to the ATM-card system already? Wow! it goes to show how long since I stepped into Marche. it used to be a fav hangout place during uni days. The Giddy Tiger says: Hey, leave some for me, yeah? i have never been to the one in Singapore, but had heard rave reviews. The Giddy Tiger says: You should pay it a visit…I wished they would open one in Penang. The first time (incidentally, also the last time) I went to Marche was not for the food. We thought it’d be a good try. Turned out so-so. I really gotta try the one down in Sg. The Giddy Tiger says: Tony Roma’s is another example, I would say. 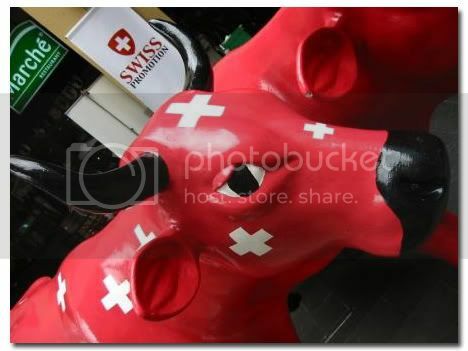 Hmm… am going to SG soon, will definitely go and try the Marche outlet there. The Giddy Tiger says: Yeah, and tell me about it ok? How did Ethan like that cow? Did he go for a ride? I must remember that root beer. Been known to drink a good root beer in my day. Is the root beer that good? I must go to Cold Storage to get a bottle. I am also a fan of root beer. The Giddy Tiger says: Yes it is. I am going to check out the Cold Storage in Penang to see if they have any available. The Giddy Tiger says: I still have one bottle in the fridge waiting for me to finish it.